Anna grew tired of her diamond "swirl ring". She wanted rustic stack-able look with some yellow and white gold to play around with. Here is the before and after A Jour Jewelry Makeover! Redesign, Revive, Re-Purpose you old jewelry into New Breathtaking Heirlooms. 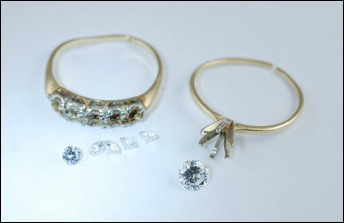 Checkout these ultimate jewelry makeover "BEFORE and AFTER" scenarios. I keep the sentimental aspect alive. 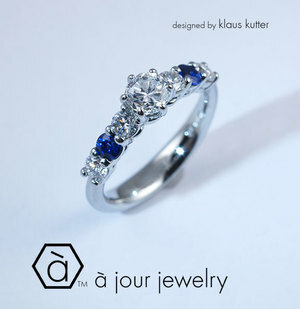 "Grandmas Sapphire", "The Stone HE Proposed With", "my Mom wore this ring every time I saw her , ...... And now its spirit is alive in a brand new beautiful ring on My Hand!" I see many tears of joy here in my store. It is very rewarding to be able to be an intricate part of stories like that. It's an Honor really. Here are a few samples. Please visit my Gallery for a bigger cross section of my work. Lots of the pieces there are actual redesigns. I was classically trained on the bench in Geneva Switzerland. From very classic to contemporary I work in Your Style. Your input is the driver. from normal and ordinary to fresh and new. ​What you feel and want is the guiding factor! Here is a real world scenario of creating a new heirloom from existing worn wedding jewelry. Redesign of jewelry at it's best. Linda came to me with this broken wedding set ready for a change. After an hour of consultation I had enough information to get started. The perfect candidate for a jewelry makeover. A winner, what an awesome piece of jewelry a top makeover ! Linda is understandably a very happy lady, a very successful redesign. And a very satisfying job! Love it! The wedding band was important. I incorporated it in center of Karen's new ring! Before and After next to each other. Another really cool jewelry makeover. Cindy wanted a bold and modern look for her redesign. That was nice teamwork with another home run. Here we found a really nice and elegant way for Nancy to wear her late husbands wedding band close to her heart. Projects like this can be very rewarding. This is the "After". The "Before" would be the single band alone.